In our opinion, for anything to be considered art it must prompt or stimulate emotion, thought and a reaction. When was the last time you smelled a perfume/cologne and wasn’t moved or affected by its lingering aroma? Did it take you to a memory? Did it make you gag? Did it make you feel a way you weren’t feeling before? Of course it did, and that’s why we consider it an art medium. Beyond the chemistry of perfumery is the element of design that’s able to quietly tap into your scent memory to create an emotional response. In the same way music can move you to tears and seeing a visually striking art piece can provoke your thought so can the power of scent. DKNY created to date the most expensive perfume called, DKNY Golden Delicious, and only a few thousand people got to see it in person and smell the undeniably must have scent. The medley is described as being a refreshing transport to the lushest garden earth has to offer. Whether you’re a scent enthusiast or you’re the kind that wears the same scent daily, perfume temporarily takes you on a sensory journey that almost forces a unique experience on you. The amount of inspirations for a visual artist range from animals, colors, or landscapes, the list can go on and on. They are not limited by anything. 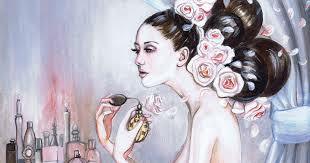 Perfumers are the same, we can create a new aroma ­­from our current emotional state, a memory, or a travel experience. The beauty behind what the perfumer and visual artist creates is when the work of art is complete the final product is left to open interpretation by the viewer/sniffer.